At Just For Love in Simcoe, we have 16 years of experience in selling adult toys, DVDs and accessories to couples, singles, bachelorette and stag parties and other customers. 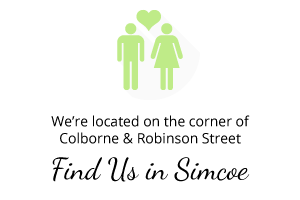 Our store in Simcoe carries an inclusive selection of toys, costumes, hosiery, lingerie, massage oils, wigs, novelties and more! Stop by to take a look, have fun and find a new gadget. Next to our wide selection of adult toys and accessories, we sell vaporizers and smoking accessories. From water pipes to smoking papers, we have everything you need to relax while inhaling aromatic smoke or incense. Visit our store or give us a call to learn more about our products. Our friendly and approachable staff will be happy to answer your questions, offer advice and let you in on the latest arrivals! In addition, at our store, you can get a skunk or a flamingo figure for your lawn.